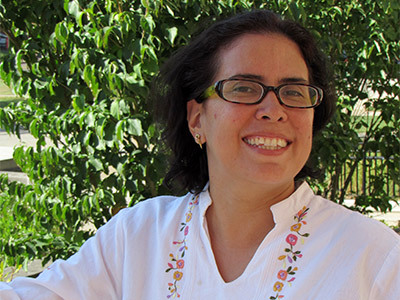 Felicia Zamora was raised in the Baptist church—in Managua, Nicaragua. “My grandfather, who was a pastor, had an illustrated Bible and a lot of books on theology, which I always liked reading,” she says, and though “my Dad’s side of the family was Catholic, I went to a private Baptist school through grade four.” Then the family moved temporarily to the U.S.
“My mom enrolled at George Mason University to earn her master’s in nursing administration, so I went to a public elementary school in Fairfax, Va., for grades five and six. It was there that I learned English.” It was there, also, that the Zamoras began attending a Mennonite church. Little did Felicia know then that this church connection would play a role in her future education. After two years and the family’s return to Managua, Felicia completed her secondary education at a school run by two missionary families. “The school started in a house, but when the student body grew, a larger building was rented and the curriculum became more formal. While there, I took it upon myself to study sects and cults, and I made a personal hobby out of learning how to defend my Christian faith in the light of their tenets.” When she started thinking about college, the family’s Mennonite connection came back into view. “We had American friends in Harrisonburg, Va., who had lived in Nicaragua in the 1980s. They’d offered to my parents that if any of their children wanted to attend Eastern Mennonite University, we kids could live with them while we studied at EMU,” she explains. “So that’s where I headed!” From 1998-2002, Felicia pursued a major in psychology with a minor in communications. She also learned about Anabaptism, and, especially as a person coming from a country plagued by violence, she identified with and appreciated the Mennonites’ pacifist views. But her return to Nicaragua after living in the U.S. for four years required some big adjustments. It was difficult to find a job, for one thing. “I began by translating materials into English—first for my mom in the field of nursing, then with the Mennonite Central Committee, and then with Compassion International. Eventually I landed a job with Provadenic, a non-profit focusing on primary health care by training people in rural areas to be the ‘doctors’ in their communities.” Felicia’s job required her to travel to communities that lacked the comforts of electricity and running water. “I learned to see these people as brothers and sisters who helped strengthen my faith—as valuable human beings discriminated against just because of where they were from,” she notes. For 14 years, Felicia connected teams of American pastors and their congregations with these communities and learned skills in resolving conflicts between the culturally different groups. But throughout that time, she also maintained her interest in reading theology. Now in the first year of her M.Div. program, Felicia likes the personal feel of the small class sizes, direct interaction with professors, and challenge of thinking differently about her faith that she finds at PTS. “I’m not here just to gain knowledge about the Bible but also to acquire skills in sharing that knowledge effectively in contexts that are different from my own.” Like the contexts of her work in Nicaragua.